On January 27, 1998, a charter was formed and our council was born. Bishop Anthony Tonnos celebrated mass for the opening ceremony. 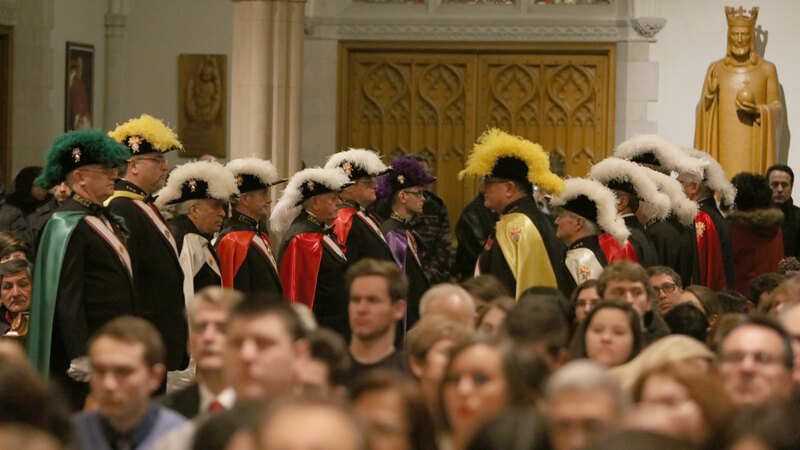 The Council of the Cathedral Basilica of Christ the King began with 40 members under the leadership of Joe Macaluso, our first Grand Knight. Thanks to Joe Macaluso and Reverend David Wilhelm, our founding Chaplain, who made possible the birth of this chapter. Following Joe Macaluso, Len Fazari became the next Grand Knight on July 1st, 1999. Under his guidance membership grew. Many church functions were held to raise money for our parish during Len Fazari’s leadership. Elections came again and on July 1, 2001 our next Grand Knight was chosen, Joe Giovinazzo. Under Joe, the executive continued keeping the council on track and maintained it focus on service to the parish. July 1, 2003 Mike Perron was elected as the fourth Grand Knight of this council. Under Mike’s leadership, many fund-raising projects got underway, including an annual golf tournament. Mike’s goals were to keep the council financially afloat, support more parish activities, and grow the membership each year. On July 1, 2006 Tony Cordeiro was elected as our fifth Grand Knight of this council. Tony increased our membership to 63 members in good standing. Tony also started our first annual pork roast dinner in 2009. Tony took on many other projects as Grand Knight to make our parish an even better place. On July 1, 2010 David Smith was elected as our sixth Grand Knight. David continued the tradition of our council contributing to our parish. On July 1, 2011 Steven Murphy was elected as our seventh Grand Knight. Steven led our council to new heights in the area of giving to Charity. Steven was also responsible for organizing a pilgrimage to the Martyrs’ Shrine at Midland. Currently, Reverend David Wynen is our Chaplain. Tony Cordeiro returned to the position of Grand Knight and was elected on July 1, 2013 as our eighth Grand Knight. On July 1, 2015 Al Schiappa was elected as our ninth Grand Knight. Al looks forward to the challenges ahead as he takes the council a new direction.